Thorn is the only known settlement in the region of Thornmarsh, which is found along the northeast border of Black Marsh, near Morrowind and the city-state of Tear. Because of the city's proximity to the Dres capital, there are several Archein villages in the wilds, each with their own Hist Tree. There are fields of Saltrice found outside of Thorn. Thorn is neighbored by several settlements, including Branchmont in the southwest, and Riverwalk in the west. 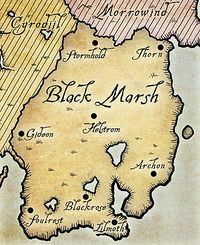 Thorn's founding is unknown, but prior to the settlement's foundation, the eastern coast around Thorn and Archon were occupied by the elven races that lived in Black Marsh, such as the Barsaebic Ayleids and the Cantemiric Velothi. These civilizations would eventually die out, like the rest of the non-Argonian races. Sometime in the First Era, Thorn was attacked by the minor House Dres of Tear in a slave raid under the command of Thalthil Dres. This raid on Thorn was described as heartbreaking, and it was depicted onto tapestries. With the successful invasion on Thorn, the minor House Dres was elevated to the status of a Great House. At some point, Thorn was burned to the ground. The Naga, Avumar, had made a successful attempt to converse with a Dremora through a portal that led into the Deadlands. Avumar had made an ominous agreement with the Dremora, which led to the razing of Thorn. Avumar had used an earthen vessel to turn energy into steam. Thorn was rebuilt sometime later. Sometime around 2E 572, the city-state of Thorn was ruled by House Dres, with the settlement being ruled by Councilman Glathis Dres. The Argonian slave, Heita-Meen, had escaped from Thorn and into Thornmarsh, where she would acquire a vision of the ongoing Second Akaviri Invasion and was later subsequently taken back to Thorn. Many Dark Elves had left Thorn to serve Almalexia in Morrowind, leaving Glathis Dres and his Archeins. Heita-Meen was able to overwhelm Dres and take over both Thorn and the Archeins. Heita-Meen would later grow an army from the slaves of Thorn, to the warriors at Stormhold to later face against the Akaviri. The outcome ended with the defeat of the Akaviri, and the birth of the Ebonheart Pact. Thorn, as well as Thornmarsh, was absorbed into the Ebonheart Pact. During the Imperial Simulacrum in the late Third Era, the city-state of Thorn was ruled by King Tibus. It had a rivalry with Archon. This page was last modified on 12 February 2019, at 15:29.